When we're talking American League and the postseason you know the usual suspects: Yanks, Sox, & Angels. Every season gives us what the A.L. Central has to offer which is less than we expected, and each season someone plays tricks on us. The '05 White Sox, the '06 Tigers, and of course the '08 Rays. However, the way the Tigers have played Advil for the Red Sox this week, we're left with one question. Whose is really contending for that 4th playoff spot in the American League? The Boston Red Sox are still breathing. Despite suffering a six game road losing streak last week, including four in the Bronx, the Red Sox are still out in front of the Wild Card chase, albeit a thin game and a half lead. Since returning from New York the Red Sox have taken three straight over American League Central leader Detroit, and seem to have found their stroke. In each victory Jason Bay has launched a Fenway blast that remind the faithful of better days earlier this season. Fueled by the ejection of Kevin Youkilis on Tuesday night, Mike Lowell has gone 5 of 7 including three dingers since replacing Youk in the lineup. Final thought: Josh Beckett is the only A.L. Cy Young candidate who will be playing for something down the stretch. Wednesday night Beckett notched his major league leading 14th victory, questions? The Texas Rangers are in this fight. For the first time in years the Rangers have some arms to go along with their bats. Tied for 4th in the American League in team earned run average and 5th in opponent batting average the Rangers are within striking distance of the Red Sox for the 4th and final playoff spot. Much like the Yankees, the Rangers only need to have their starting pitching not put them in a hole. An offense featuring Michael Young (140 hits, .317 BA), Nelson Cruz (25 HR's), and fellow All-Stars Ian Kinsler and Josh Hamilton, starters like Kevin Millwood and Scott Feldman (11-4) just need to eat innings and keep the runs down. Final thought: The Rangers are 24-13 within their division this season. If it comes down to it, you should know the Rangers dominate the American League West. The Tampa Bay Rays Yes, I'm calling it rightnow. The defending A.L. Champs are finished, el fin. 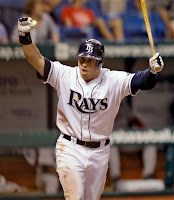 This is more about what the contenders have than what the Rays don't. Carlos Pena is the only 30+ home run guy in the American League, I get that. However, James Shields & Matt Garza are a combined 14-16 and despite their recent success I'm not buying it. They've got to finish the season in the American League East, a division which they are just 23-16, five fewer wins in the division than both Boston & New York. Three remaining series against the American League West including two series against Texas, did I forget to mention their 8-17 record against the A.L. West? It's not to say that the Rays don't have a powerful offense (3rd in the majors in runs scored) and it isn't to take anything away from a team that handed the Red Sox a plane ticket home last season but the Rays just aren't selling us right now. Final thought: Does J.P. Howell, the newly appointed Rays closer compare to the likes of veterans Mariano Rivera and Jonathan Papelbon? A combined 60+ saves recorded for the Yanks & Sox closers, who shuts the lights out for the Rays? Look for the N.L. verson of Contenders v. Pretenders on Saturday morning. A quick reminder for the fans of LynchyRightNow: You can follow myself and co-host of The RightNowPodcast, Joe Roche, on Twitter and check out the RightNowPodcast weekly at RightNowPodcast.